Dust Proof Silent Fanless Kaby Lake Quad Core i7 PC, dual LAN. Uses Akasa Euler TX fanless case. 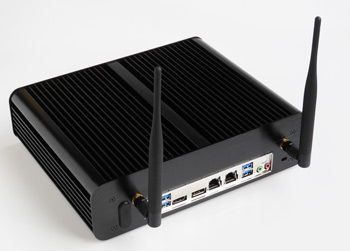 The latest 7th Generation (Kaby Lake) Quad Core i7-7700T processor gives performance of a high end large PC, yet it runs so cool that it can be fitted into this fanless mini-PC, consuming very little electrical power. You really can now have everything... computing power, very small dimensions, low power consumption and silence. VESA (100x100) mounting screws are included, so the PC can be mounted onto the back of large LCD monitors/TVs that have VESA mounting holes. Rubber feet are supplied for use on a desktop. Need ultra fast SSD Speeds, with over 3000MB/s read speeds? We can configure this unit with up to 32GB DDR4 Memory and 2TB SSD. Please contact us if you want a custom configuration. We can also pre-install with Windows or other Operating Systems.